As soon as the new site is ready, you’ll find the directions automatically. Not to worry – I’ll be writing lots, then and there. Once the formatting’s done I’ll have more time to spend on ideas and information. Today I visited my oncologist for a checkup. Waiting to see her, I sat in a floral fabric chair by a matching wood veneer coffee table strewn with worn magazines – Architectural Digest, Better Homes and Gardens and some old Time issues – I couldn’t help but think of how I was feeling seven years ago. Then I was anxiously waiting to know my blood counts – the white cells, red cells and platelets – to see if they were sufficient for my scheduled chemotherapy. That January, my white blood cells were so low that some doctors thought I should enter the hospital for IV antibiotics. (I declined.) My mouth was so full of sores I could hardly speak or eat. My hair was gone and I wore a strange wig. My right arm was broken (yes, I’m right-handed) so I couldn’t write or type. I was pale, weak with anemia and covered with bruises. Chemo-brain, which I’d never learned about in med school, was just starting to set in. Before then, I’d always taken pride in keeping up with medical and science journals. But I could barely muster the energy to take a glance at those heavyweights. Even regular magazines appeared fuzzy, a scary symptom for an oncologist who knows too well that breast cancer cells can spread upstairs. I wanted my next treatment. I wanted to get it over with, to put the breast cancer behind me. I knew she was right. But a week seemed like a lifetime to me then. I understood that giving chemotherapy suppresses the bone marrow, the body cavity where blood cells form. If my white cells dropped any lower, I’d be at serious risk for bacteria in the blood or invasive yeast in my mouth and throat. If the treatment reduced the red cell-forming elements in the marrow, I’d become more anemic. Already I was on a medication that affected the function of platelets, the blood-clotting cells. If the platelets fell further, I’d be at greater risk for bleeding. I had no choice but to wait. So I did. The next week I got my treatment, and we were back on track, at least for a while. Today, sitting in a similar chair, I calmly read the arts section of the newspaper and started working on the crossword. I’d tucked the New England Journal of Medicine into my bag, thinking I should read that, but it didn’t seem right. I wanted to remember what it’s like to be a patient who doesn’t know if she’ll make it through. Several of my friends, mainly women, are affected now by cancer that’s spread. They go to see their oncologists regularly, and sit and wait for their blood counts, and sometimes get their treatments. Most hold undeniably upbeat, positive attitudes. But the reality is tough-going, day-to-day and month after month, with no easy end in sight. How much easier it is to look back on a situation – a tumor – that was removed in an early stage. My cancer treatment wasn’t easy, but I don’t regret it for a second. When my oncologist took me into her office today we chatted for a while and then she examined me. “Come back next year,” she said. In my medical storybook, it doesn’t get much better than that. Something I learned as a medical intern is that there are worse things than dying. As I recall, it was sometime in April, 1988. I was putting a line in an old man with end-stage kidney disease, cancer (maybe), heart failure, bacteria in his blood and no consciousness. Prince was on the radio, loud, by his bedside. If you could call it that – the uncomfortable, curtained compartment didn’t seem like a good place for resting. An attending physician, a smart guy I respected, approached me as I completed the procedure. “It’s kind of like Dante’s seventh circle,” he noted. Indeed. A clear, flexible tube drained greenish fluid from the man’s stomach through his nose. Gauze covered his eyes, just partially. His head, hands and feet swelled with fluid. A semi-opaque hard-plastic instrument linked the man’s trachea, through his paper-taped mouth, to a noisy breathing machine. His skin, barely covered by a stained hospital gown, was pale but blotchy from bleeding beneath. An arterial catheter inserted by his wrist, just where I might have taken his pulse had he been healthier. A fresh adhesive covered the cotton gauze and brownish anti-bacterial solution I’d placed over his lower right neck. “Yeah,” I said as we walked out of the room to review another patient’s chart. I wondered if the ICU staff would mind my changing the radio station, just in case the patient could hear but not tell us he preferred WQXR. “There’s no way I would let this happen to me,” I remember thinking. This month, a report in the ACS journal Cancer indicates that most U.S. physicians don’t talk with their patients about end-of-life issues until death is imminent, if they do so at all. The study, based on canvassing over 4000 doctors who care for cancer patients in California, North Carolina, Iowa and Alabama revealed that only a minority of physicians would raise the subject of a DNR (do not resuscitate) order or the possibility of hospice care for a patient with metastatic cancer with a life expectancy of 4-6 months. The article has generated considerable, appropriate attention in the press and for good reason – it bears on health care costs, patients’ rights, doctors’ communication and time constraints and a host of points relevant to the practice of medicine in 2010. Don’t wait for your doctor to talk to you about death and dying. Be proactive about your wishes and the kind of care you wish to receive, especially if you’re sick with a serious medical condition. Take the initiative – document your end-of-life preferences as best you can, according to the law of your state, and tell your physicians about any limits you’d like to set on the care you might receive. It’s a conversation worth having, early. Giving blood is something that’s close to my heart. When I was 14 years old, I received seven units of packed red blood cells from strangers during and after spinal surgery. In 2003 when an orthopedist bravely cut the steel rod fused to my spine, readjusted it and inserted new hardware, I got another four units. So I’m keenly aware of this mitzvah, of giving blood. It saves lives. Today, thousands will donate blood to honor the birthday of Dr. Martin Luther King, Jr.
Donors giving blood from 2 to 7 p.m. Monday at the American Red Cross center, 341 White St., Daytona Beach, will be donating in memory of Dr. Martin Luther King Jr.
Each person will sign a scroll saying they donated blood in King’s memory. That document will be presented to Bethune-Cookman College during a special assembly Wednesday, said JoAnn Lord, Red Cross spokesman. Today I spoke with Daniel J. Eberts, corporate communications manager for the Florida Blood Services. Dan’s been working with that agency for over 22 years. “The goal is to create awareness of the ongoing need for blood,” he says. The agency collects blood every day of the year except for Thanksgiving and Christmas, he notes. “Dan the Bloodman” – as Eberts is sometimes called – is not shy in his passion for blood donation. Rather, he’s on YouTube, singing on how you, too, can give blood. 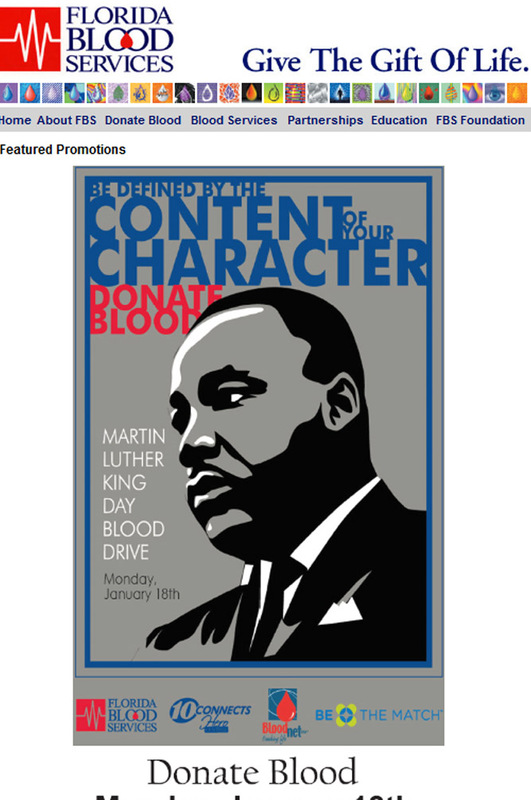 On recent MLK Days the Florida agency has collected between 500 and 700 pints of blood, he reports. The holiday presents a special opportunity to gather additional, much-needed minority registrants for the National Marrow Donor Registry. The American Red Cross provides information on when and where to donate blood, as well as helpful instruction on the process of giving for first-time donors. The AABB, formerly the American Association of Blood Banks, covers transfusions and related therapies. America’s Blood Centers – a large network of non-profit community blood centers. The New York Blood Center – a terrific local resource for my neighbors, a pioneer in blood banking and resources for patients worldwide. The National Marrow Donor Program helps patients with leukemia and other conditions find matching bone marrow donors. The agency provides, also, financial assistance to some who can’t afford needed transplants. January is National Blood Donor Month. For those who can give, it’s never too late – the need is year-round. And a personal note of thanks, from me! Into my Google Reader this morning came a post from Biophemera (an intriguing blog at the interface of art and science). Scientist-artist-blogger Jessica Palmer offers a provocative clip featuring Alex Lundry, a self-described conservative political pollster, data-miner and data visualizer. “So what changed, why now?” he asks rhetorically. Scary stuff. We’re vulnerable to brainwashing by pie graphs with pretty colors. Men are hired to collect and represent data with a particular aim. And there’s more to come this way, faster than ever by twitter. So why here? 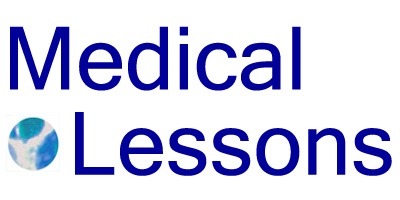 Why a Medical Lesson? Because the same is true for health information. One of the first rules of medicine is knowing your sources. Before you make a decision, consider: did you read or hear about a treatment in a textbook, in a reputable journal, at a scientific meeting or over lunch with a representative from a pharmaceutical company? Immersed in data as we are, it’s tempting to grasp at the best-presented material regardless of its intrinsic value. Nifty graphs can persuade or fool even the best of us. 3. Read the fine print and identify the perspective of who’s depicting “data” in charts and graphs – when medical information comes onto your TV screen or magazine page, there’s a good chance someone’s got something to sell you. Mind those origins and axes! Yesterday, Dr. Pauline Chen reported in the New York Times on virtual visits, a little-used approach for providing care to patients hundreds or thousands of miles apart from their physicians. Telemedicine has the potential to improve quality of care by allowing clinicians in one “control center” to monitor, consult and even care for and perform procedures on patients in multiple locations. A rural primary care practitioner who sees a patient with a rare skin lesion, for example, can get expert consultation from a dermatologist at a center hundreds of miles away. A hospital unable to staff its intensive care unit with a single critical care specialist can have several experts monitoring their patients remotely 24 hours a day. First, my recent visit to my internist’s office on East 72nd Street, a short walk from my home. When I see my doctor she smiles warmly, shakes my hand firmly and examines me from head to toe. She takes my blood pressure with an old-fashioned sphygmomanometer, looks at my eyes and into my throat, applies a stethoscope to my scarred chest as she listens to my heart and lungs, and palpates – “feels” in doctorspeak – my lymph nodes, liver and spleen. All that along with a neurological exam; she sees how I stand, walk and balance my head over my torso. Second, my husband’s conversation with his mom yesterday evening, via Skype, transmitted between his laptop in our living room and her computer in a Buenos Aires apartment. When Vladimir Kozmich Zworykin addressed the 1956 assembly on “Electrical Techniques in Medicine and Biology,” he marveled at the technological feats of computers, and envisioned how these new instruments might be applied in health care. Zworykin, an inventor of television …was privy to the newest developments in applied science. We’re back in the future! My take on telemedicine includes three components; each corresponds to one association above. 1. Telemedicine is not the same as real medicine. I like seeing my doctor in real life and am reassured by her true presence in the room. Besides, a hands-on exam has some tangible benefits. A good doctor, who knows how breathing sounds should sound, confident in her examination skills, might skip an x-ray she’d otherwise order. A competent hematologist, skilled in palpating her patients’ lymph nodes, liver and spleen, could spare us the costs and risks of some CT scans and MRIs. 2. Virtual visits might help. The reality of medicine requires innovation and compromise – making the best of a sometimes difficult situation. As Pauline Chen points out in her column, there’s a shortage of doctors affecting some, particularly rural, parts of the U.S. Policy experts anticipate the problem won’t go away with current health care reform measures, and some business reports warn the situation will get worse. Telemedicine, while not ideal, might ameliorate this effect and make a positive difference in the health of people living far from major medical centers. The technology could, indeed, connect patients with specialists who would otherwise be out of reach. 3. The future of medicine will embrace some elements of telemedicine. We just need to fine-tune the process. As I see it, Internet or satellite-directed medical examinations are most promising for image and data-centric fields like radiology and pathology. It’s telling that Pauline Chen’s first example pertains to dermatology (skin diseases). Sure, I think a far-away expert’s view of a skin lesion could be helpful – it might reassure some that a mole or a rash is nothing to worry about, or inform them that indeed, they should hop on a train to Memphis. For patients with benign-appearing lesions, telemedicine could save costs and time in travel and unnecessary appointments, besides biopsies. But I’m wary of implementing this tool in primary care areas and interventional fields like surgery and obstetrics. The prospect of delivering babies upon real-time instruction by doctors in cities far away is not what I’m hoping for, at least not for my kids’ kids. 1. “Real” Alternative Medicine. By this I don’t mean infinitely-diluted homeopathic solutions sold in fancy bottles at high prices, but real remedies extracted from nature and sometimes ancient practices. A good example is curcumin, a curry ingredient from the root of the turmeric plant. We’re just starting to uncover this compound’s anti-cancer effects in humans. Another natural antidote that’s gaining ground is green tea; scientists are sifting through its components to see how it reduces cell growth in some forms of leukemia and other tumors. 2. Chemotherapy Pills. Why get treatment through an intravenous catheter if you can pop some pills instead? To be clear, some of the best and most effective cancer therapies require infusion. And just because a medication can be taken by mouth doesn’t mean the side effects are trivial. But quite a few targeted therapies, like Gleevec or Tarceva, besides some old-fashioned drugs like Leukeran and new forms of old agents, like Xeloda, work just fine in pill or capsule form. Many patients, especially those with limited life expectancies, would gladly choose an oral combination therapy, the sort of medication cocktail taken by AIDS patients only for cancer, instead. A gradual shift from intravenous to oral therapies for cancer would transform the practice, and economics, of oncology as it’s practiced in North America. 3. Environmental Hazards. Where we live, what we carry and ingest surely affect our bodies and our cells. We’ve learned about Bisphenol A (BPA), an estrogen-like molecule that leaches from plastic food containers into the foods we eat. Now, we should expect and demand more information on what’s really in the water, so to speak. And in our sunscreens, and in so many chemicals we use routinely and without hesitation. 4. Health Informatics. The Pew Research Center reports that two thirds of American adults are going on-line for health information. But that’s only part of the story. Sure, the internet makes it easier for people to learn about medical conditions, but the same applies to physicians. In principle, the internet should help doctors stay current, make sound decisions and provide better care. Electronic health records (EHRs) will, in the long run, reduce costs from duplicate testing, faxing and re-faxing of reports and, more importantly, lessen errors from illegible or incomplete medical files that are too-often inaccessible. Over the next decade, we’ll see how patients find value in their own records (or don’t), how privacy issues play out, and if electronic documentation of millions of health reports provides, in itself, new information on disease trends and treatment effects. 5. Better Cancer Monitoring. The costs and risks of repeated CT scans are very real. For a cancer patient undergoing therapy, the current standard involves multiple scans at intervals of months or even weeks, to see how a tumor is responding, or not, to a particular treatment regimen. Once in remission, some people undergo additional periodic studies just to be sure there’s no evidence for the tumor’s recurrence. The news is that easier, more accurate and less dangerous methods for monitoring tumors are forthcoming. Using microchip-based detectors doctors can, using just a few drops of blood, measure the extent of a colon or lung cancer and examine how tumor cell genetics change during treatment. Over time, this and similar technologies will improve and, with standardization in manufacturing, come down in price. 6. Palliative Care. Not everyone wants to spend the last days of his or her life in an ICU hooked up to a ventilator with tubes and intravenous lines. But few people prepare for the end of life when it happens in a hospital, and doctors don’t generally talk about it in advance. Palliative care, the kind of medicine aimed at treating symptoms, rather than achieving cure, is underused in the United States. Over the next decade, we should see better education of doctors in this essential field in cancer medicine, and of the public, too. 7. Cancer Vaccines. These work by immunizing a person against a tumor just as one might, instead, inoculate a person with a modified virus or bacterium to stave off infection. Cancer vaccines would stimulate and harness the body’s normal immune cells to confront and eradicate cancer cells. This year, the FDA will take another look at Provenge, a vaccine that’s designed to treat men with prostate cancer. Similar biological agents are in the works for most other tumor types. We’ll be hearing more on these innovative drugs that, so far in clinical trials, appear to have few side effects. Whether the vaccines are effective – if they can shrink tumors – we’ll have to wait and see.